This Week’s Cannabis News Round-Up:Democrats Become First Major Party to Back Pathway to Marijuana Legalization; Your Kid Is Far More Likely To Be Poisoned by Crayons Than Marijuana; Oregon Teen Could Face a Year in Prison for a Gram of Marijuana; The Latest on Marijuana and Weight Loss; Oregon State Fair to Feature Marijuana Plants; 51 Foot Joints Parading Outside the DNC; Publix Stumbles Into PR Hornet’s Nest After Florida Anti-Pot Donation; and more. Your Kid Is Far More Likely To Be Poisoned by Crayons Than Marijuana — A new study in the journal JAMA Pediatrics is making waves this week with the news that there’s been a sharp uptick in emergency-room visits and poison-control calls for marijuana poisoning among children in Colorado. This Washington Post article puts those numbers into proper perspective. The Latest on Marijuana and Weight Loss — Want to drop some weight? To lighten up, the key may be lighting up. Medical research has revealed smoking weed can actually contribute to fat loss and enhance fitness-related goals. 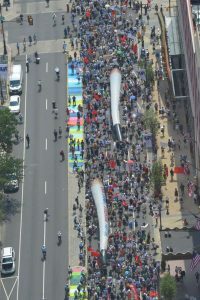 51 Foot Joints Parading Outside the DNC — As the Democratic National Convention opened on Monday, a band of cannabis activists paraded through the streets of Philadelphia with two enormous 51-foot joints. The massive inflatable J’s became an instant hit on social media thanks to this Twitter photo by a pilot with the Philadelphia Police Department’s aviation unit. Democrats Become First Major Party to Back Pathway to Marijuana Legalization — Democrats meeting in Philadelphia have made history, voting to approve a national platform that endorses a “pathway” for the legalization of marijuana. As a first step toward legalization, the platform, approved Monday, calls for removing marijuana from the federal government’s list of Schedule 1 drugs, those considered the most dangerous. That list includes LSD and heroin, drugs considered to have a high potential for abuse and no medical purpose. Hugo, Colorado Water Safe to Drink After Conclusive Tests Show No THC — Water in the town of Hugo is not contaminated with THC after all, state tests concluded Saturday morning. Saturday morning’s update from the Lincoln County Sheriff’s Office said the initial test kit results are now believed to have been false positives. Suspended Colorado medical Doctors Sue State Board — A Denver judge on Friday temporarily blocked the suspensions of four doctors who were the first in the state to be punished for allegedly over-recommending high plant counts to medical marijuana patients. Publix Stumbles Into PR Hornet’s Nest After Florida Anti-Pot Donation — The Publix chain of supermarkets and pharmacies has come under heavy social media criticism after public disclosure records showed the wealthy family which founded the chain is a major contributor to the effort to defeat Amendment 2, which will appear on the November ballot and would increase access to medical marijuana in Florida. It was revealed earlier this month that the billionaire Jenkins family, that founded the Publix supermarket/pharmacy chain, has given $800,000 to a group fighting the legalization of medical marijuana in Florida. Oregon Teen Could Face a Year in Prison for a Gram of Marijuana — On April 7, 2016, the U.S. attorney for Oregon filed a one-count federal misdemeanor charge against Devotre Thomas for possessing “about a gram” of marijuana, according to his public defender, Ruben Iniguez. That’s barely enough cannabis to dust the bottom of a Ziploc. Oregon State Fair to Feature Marijuana Plants — The Oregon State Fair celebrates oddities like the “curviest vegetable” and the “most misshapen fruit.” Fairgoers can marvel over award-winning onions and pumpkins and snap photos of the top pig and llama. This year, the state fair is adding a new attraction: prize-winning marijuana plants. For the first time, Oregon’s marijuana crop will be on display at the annual event, which runs Aug. 26 through Sept. 5. Shopping with Senior Stoner — Go shopping with Senior Stoner as we share some of our favorite Marijuana Products. 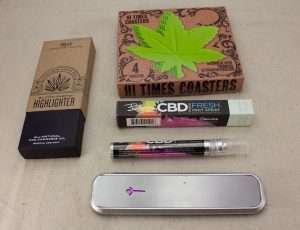 In this eclectic marijuana shopping experience we’ll look at our favorite new vape pen by Bloom Farms, a nifty set of silicon marijuana coasters by Gama Hi-Times Coasters, Bhang’s CBD-breath spray, and the Genius Pipe — an innovative new way to enjoy smoking marijuana. High Potency Edibles — In every cannabis lover’s life, there comes a time to explore the frontiers of one’s tolerance for edibles. Being able to hone in on an ideal THC dosage level, measured in milligrams, is useful knowledge for any stoner to have, but I honestly didn’t know mine, aside from knowing it was “a lot.” I purposely set out to push those boundaries and discover just how high I could get.